When Tony Greig died at the end of December 2012 it quickly became apparent from the comments and tributes on the Cricket Web forum that far more people recalled him as a commentator than as a player – that, perhaps, is the nature of an internet forum, where over-50s are generally in a small minority – but the same must be true of his sometime England colleague Geoffrey Boycott, six years Greig’s senior and one whose England career ended only four years later. Boycott was as divisive and outspoken a figure as Greig, although the two no doubt had full respect for each other’s ability. Boycott, it’s fair to say, never had Greig’s charisma and popular appeal. If the South African was the Pietersen of his day, Boycott was the Trott – a man to fill bars rather than empty them. He was, though, the perfect example of a cricketer making the most of his ability. He might not have had the God-given talent of a Ted Dexter or a Tom Graveney but what he had was a seemingly inexhaustible work ethic, formed in his youth in Fitzwilliam in South Yorkshire. His childhood was not an easy one. When Geoffrey was ten his miner father Tom suffered a serious accident at work. There was no compensation and the small amount of sick pay he received was a fraction of what he’d been earning. Geoffrey showed some ability at football and rugby union. But encouraged by his uncle he took to cricket from an early age, playing for his local village, then Barnsley, as well as school sides. It was in League cricket that he came into contact with Dickie Bird and Michael Parkinson, among other county players of the future such as Jack Birkenshaw. In his mid-teens there was a setback as his eyesight deteriorated, and he was fitted with spectacles. Surely he could not forge a career in sport now? He wrote to Mike Smith of Warwickshire, who gave him advice about the type of glasses suitable for cricket, and reassured him that he need not give up hope. Hampshire’s Roy Marshall, he was reminded, was another who seemed to find it no impediment. At 17 the young cricketer left school and, with the family still badly off – his father had been found a job above ground but on lower pay than before – had to find work. He took a position at the Ministry of Pensions where he had to deal with a number of benefit claimants, many, like his father, the victims of industrial accidents or illness caused by poor working conditions. No doubt he felt fortunate not to have to go down the pit himself – his poor eyesight would not have permitted that, even if he hadn’t secured reasonable exam results – but by this time he’d set his sights on a career in cricket, not in the Civil Service. When Yorkshire, where he’d trained with the Colts under the watchful eyes of Arthur Mitchell and Maurice Leyland, gave him a Second XI debut in 1959 he had to take time off work, an arrangement he managed for a few years. 1960 was a frustrating season – a hamstring injury cost him several weeks in mid-season and there were no more matches for Yorkshire Seconds, although he was 12th man for the first team in a match at Middlesborough. Worse, contemporaries such as John Hampshire and Chris Balderstone seemed to be making better progress than he. During the winter Boycott left the Barnsley club for Leeds. The Leeds captain was on the Yorkshire committee and of course the proximity to the county’s Headingley headquarters would, he felt, help his chances. It is slightly confusing checking Wisden for this period. Yorkshire, as they did well into the 1970s, played two ‘second elevens’ – one in the Minor Counties Championship, which was known as the ‘Colts’ (future England players Richard Hutton and Don Wilson , as well as Hampshire and Balderstone, were among Boycott’s team-mates in 1961) and the other in the Second XI Championship. Boycott finished top of the Colts averages, with a top score of 156 against Cumberland, with Balderstone in second place – in the Seconds the positions were reversed. 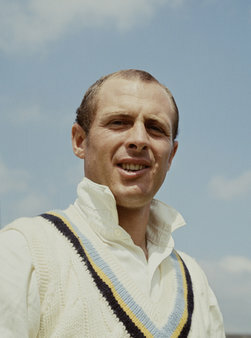 It was no surprise when Boycott made his first-class debut the following year. In 1962 the visitors were Test cricket’s newest side Pakistan, making only their second tour of England – the first having been eight years earlier. The Yorkshire fixture came just before the second Test and was played at Bradford. Boycott, making his first-class debut, was dismissed for 4 in each innings by medium-pacer Antao D’Souza, a name he recalls to this day. Despite this unpromising start he was picked for the next two matches – his first in the Championship – both in away games, at Northampton and Chesterfield in Derbyshire. He was involved in run-outs in each of these two outings – first Phil Sharpe and then Ken Taylor. A reputation was established at the earliest possible opportunity. By now his team-mates were beginning to get to know the earnest, driven young man from Fitzwilliam – or as much as they were able to. Socialising after the game was not his style. Ridiculed by Brian Sellers when in the Colts for not drinking beer, Boycott preferred to go his own way after the day’s play. While it’s unlikely that he intended to alienate himself from his team-mates he inevitably gained an image as something of an outsider. His abiding interest was in scoring runs, batting for as long as possible and supporting his stricken family (his father lingered on until 1967). Four Championship matches, with a best score of 47, was a start. The next season would see Boycott’s breakthrough. There was a new captain, and Brian Close was more sympathetic to the young batsman than the outgoing incumbent Vic Wilson, who had been critical of Boycott’s cricket and reprimanded him for those run-outs. Established at the top of the order early in the season, Boycott scored his maiden first-class century in June, in the Roses match at Sheffield (watched by his father on TV in his hospital bed) and resigned from the Ministry in July. At the end of the season he was second to his childhood advisor MJK Smith in the national averages, with 1,628 runs at 45. He topped the county’s Championship averages, the only batsman to make a thousand runs, with 1,446 at 46. In the following year’s Wisden he was pictured, along with Hampshire – how their careers would intertwine over the next fifteen years. He was left out of the tour party to India the following winter but must have come under consideration; he said in a recent interview that he felt that he ought to have gone. In fact two of the openers who went on that trip, Brian Bolus and Micky Stewart, never played for England again. There hadn’t been a well established opening pair since the days of Hutton and Washbrook – the likes of Peter Richardson and ‘Noddy’ Pullar proving just short of the highest class – but there would be one very soon. A young left-hander from Norfolk called John Edrich was making plenty of runs for Surrey, and an eventful England career beckoned for the young Yorkshire batsman in the glasses.